Today I took a solo hike up Bear Mountain, a 6.7-mile loop from the Undermountain Trail at Route 41 in Salisbury, CT. Bear Mountain is CT's tallest peak at 2,316 feet. 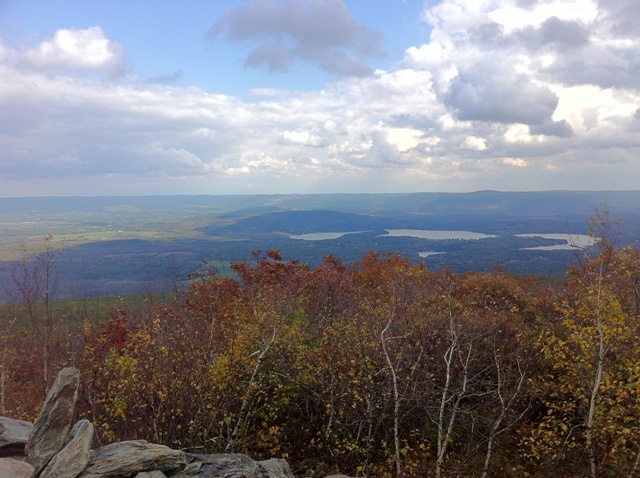 Interestingly, CT's highest elevation point (2,380 ft) is on a mountain whose peak actually lies in Massachusetts (Mount Frissel). The hike up was not very birdy, as expected. The woods in October can be very quiet, and today's high winds did not help things. Highlights included a single Common Raven and two Hermit Thrushes. View from the summit of Bear Mountain, just before a brief downpour began. Two Black Vultures were soaring over downtown Salisbury on my way home.